This comes from a life-long ‘stoveaholic’ that has way too many stoves and is not at all in recovery. The addiction is life-long and in full bloom with no hope for recovery. I have been an avid tent camper my whole life, from the time I could walk to today (57-years old) I have had all kinds of camping gear. That includes stoves that ran on all kinds of fuel. 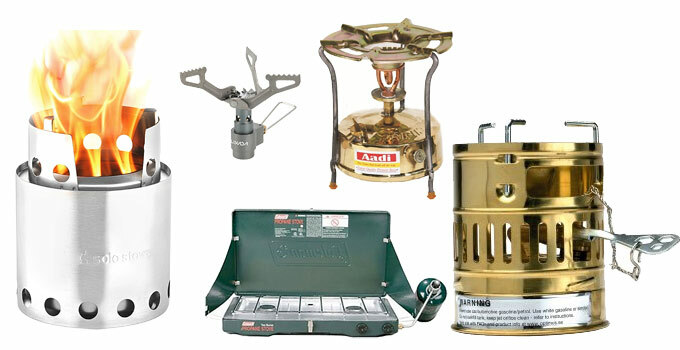 The stoves I have are butane, gasoline-white gas, propane, wood, and kerosene. Most of them are small backpack stoves and are not made to serve a large family. I still have a soft spot for my Svea-123 stove as it’s a stove that has been in production since the late 1800’s. It has been to everyplace on the planet, in all kinds of temps. From Death Valley to the top of Everest, millions of back-country meals have been cooked on the Svea over the last 120-years. I have 3 of them as they are hands-down the best backpack stove ever made. Here is the Svea 123. I would not want to ‘not have’ this stove. It’s the first stove I bought when I was 15-years old and in the Boy Scouts. Still works as good the day I bought it. U-Tube is full of people that have 30-year old Svea’s that still work good. One guy had one in a bucket in the back of his truck. The bucket filled up with water and froze the stove in the ice. He thawed it out and without changing fuel he lit it up and it worked good. It does have a learning curve to get it to work, but it’s not really hard and you can look on U-Tube to see how to do it. Over the last several years I have gravitated to a (boat) alcohol stove, several homemade alcohol and wood stoves, the Svea and a homemade forced air stainless steel woodgas wood stove. I see a few problems with gasoline, kerosene, propane and butane stoves. That being they need an ongoing infrastructure to get fuel to run them. And it’s also a concern with the associated cost of buying fuel. You can do as I do (stock up on fuel). But understand and plan for a Post-SHTF World that may be short on these fuels, and your reserve will run out at some point. I stock up on the fuels for these stoves, but it does take up space. I have a butterfly kerosene stove that fills the SHTF / economic downturn world fairly well. I have stored the stove, extra parts and years of fuel. The Butterfly Kerosene Stove is not a camp stove, it’s a kitchen stove that lends itself to off-grid use quite well. I read that 20% of the people on the planet use this type of stove for every day cooking. Here is what it looks like; you can also buy a steel oven that sits on top of it. I have the oven for it. The one I have is a bit different in layout than the picture above, but basically this is what I have. I bought it a few years ago to be able to can food off-grid if needed. The one I have has more space between the burners so 2 large pots can easily fit on it. I have over 35 gallons of kerosene stored up for this stove. It burns a bottle of fuel for every 12.5 hours of running. I’m about to get another 25+ gallons of fuel that my brother had stored up (last week he just lost a 3-month battle with a bad heart attack and his daughter doesn’t want the kero.) I figure I have a few years of fuel for it. It runs over 12-hours (at full burn) on a tank. I can’t see cooking on the stove more then 6 to 7-hours a week. A gallon of kero should last about a month even with a lot of use. I have two 12-gallon barrels of kero stored up and several 5-gallon jugs, full and with a fuel stabilizer. Add to that my brothers fuel and I’m sure I can cook for 4 or 5-years with it. Kerosene is an easy fuel to stock up on. It is not under pressure so no gas to slowly leak away. Short of a hole in the tank it’s not going anyplace. It’s a fairly shelf stable fuel to store. Add stabilizer to it and 10-years is not unreasonable. Like any fuel, take care with storage. And like all fuels it’s not allowed in storage units or apartments. And you have to protect if from growing legs and walking off. I have 5 or 6 propane stoves from small single burners up to the green Coleman 2-burner stoves we all have seen. Propane and butane stoves are nice in that they both work almost the same as a natural gas kitchen stove. You turn the knob, light it and cook just like you normally do. Flame adjustment is super easy. Each one has it’s good and bad points. Propane is good for cold weather. It’s under 125 psi and it pumps out the propane even when it’s cold outside. Butane is under much lower pressure (Not sure but I think it’s like 20-psi) and doesn’t work well in the cold. Propane needs heavy metal canisters so they are heavy. Butane uses lightweight tin canisters so they are easier to carry around. This makes butane popular with backpackers, you don’t see any backpackers with a propane stove as the tanks are too heavy. I have 1 butane stove, with a matching lantern and 20 canisters. I bought it years ago from Big Lots. I don’t use it much, nothing against butane. I just don’t use it. One problem I have seen with butane is that the canisters are proprietary in nature. Every brand seems to make a canister that only their stoves use. And within a few years they stop making the stove and canisters. You then are stuck with a stove that works great but has no fuel. The one butane stove I have (made by Bear Country) works great and I will likely give it, the lantern, and 20 or so tanks to someone post-SHTF. I bought a Coleman backpacking stove and lantern that worked great, but 10-years later Coleman stopped making fuel for them. It was a good fuel that was a mix of propane and butane. They solved the problem of butane not working in cold weather and at the same time solved the heavy propane tanks by having a mix of both fuels in the same canister. It was a very good idea, but with no ongoing fuel the stoves are useless. I now shy away from butane stoves that I likely won’t be able to use because of the company making the decision to stop supporting them. Post-SHTF butane canisters are going to be hard to find, heck you see few of them in camping stores today. This is why I don’t use butane much. This is why I like gasoline/ white gas, alcohol and wood stoves. These fuels are abundant. Wood is free, I can walk around the yard and in 5-min can get enough twigs for several days of cooking. Wood backpacking stoves are a bit heavy to carry in a backpack (backpacking or bug-out situations) but they start to pay for themselves as far as weight around the 20-day mark. Before 20-days they are heavy, but after 20-days they start to shine because the heavier stove weight is offset by the ability to gather fuel as you go. Other stoves get heavy if you account for more then 2-weeks of fuel needed. In a bug-out that doesn’t last too long alcohol or butane could work, but if the event goes on for a long time wood stoves rule the day. My Svea is actually a white-gas (Coleman fuel) stove, but for over 30+ years all I have run in them is unleaded gasoline. Most white-gas stoves will clog up if ran on gasoline, but the Svea has a cleaning needle that cleans itself every time you turn the knob on. Next to wood stoves, alcohol stoves are the most reliable stoves made. Most of them have zero moving parts. Nothing to go wrong with them short of running them over with an auto. Also in 5-min you can make an alcohol stove out of things you throw away in your garbage. Alcohol stoves run on denatured alcohol, not rubbing alcohol. Rubbing alcohol doesn’t burn well if at all because of the water in it. Denatured alcohol is sold in many stores in the paint department. Just look for denatured alcohol / stove fuel printed on the can. It sells for $6.00 a quart or $14.00 a gallon. Obviously the gallon is a better buy. As long as the can is sealed up tight it will last for years. 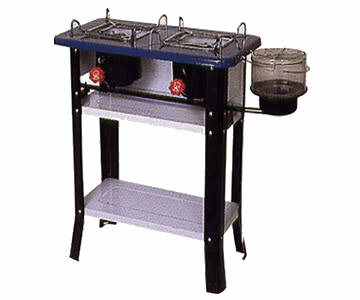 You can also make your own alcohol for these stoves; I would bet this may be a good SHTF skill to know how to do. Practice it now if you have such aspirations. Denatured alcohol stoves are safe to use indoors, denatured alcohol doesn’t generate explosive fumes, and a alcohol stove fire can be put out by throwing some water on it. It will die the second the water hits it. These 2 reasons are why denatured alcohol is used on boats. Fire and explosive fumes are frowned upon on boats. For an indoor fuel it has a lot going for it on the safety issue. If you are on a budget or just like to make things a quick search on-line and you can find endless info on making wood and alcohol backpack stoves. Search homemade alcohol stove and Hobo stove. Don’t forget the ultimate SHTF cooking method that has been used for 50,000 years, the camp fire. It’s also fun to sit around a camp fire with friends.